Since its launch and move to the Hollywood celeb’s car of choice, the Toyota Prius has gone on to become one of the world’s best-selling vehicles. 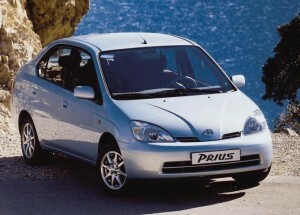 More than five million Toyota Prius and Lexus hybrid vehicles have been sold around the world since 1997. That figure is set to grow as the company plans to introduce 18 new hybrids and a fuel cell vehicle within the next two years. The current range of nine Toyota and Lexus hybrids in the UK will increase too, first with the arrival this summer of the new Lexus IS 300h executive sports saloon and the British-built Auris Touring Sports Hybrid, Europe’s first full hybrid family estate car. This will give it unprecedented market reach, from the Yaris Hybrid supermini all the way to the Lexus LS 600h limousine. Sales of Toyota and Lexus hybrids are nearing the 100,000 mark in the UK since the original Prius made its debut here in 2000. This contributes to a European figure of 544,184 cars sold up to the end of March – more than 10% of the global figure. The way in which customers have come to understand and embrace hybrid is reflected in the speed of sales growth: in Europe it took seven years for the first 100,000 to be sold, while in 2012 alone the figure was more than 109,000. Toyota calculates that its hybrid vehicles have contributed to around 34 million tonnes less CO2 entering the atmosphere, compared to the impact of the same number of petrol-powered vehicles of similar size and performance. In terms of fuel, it estimates on the same basis that 1.2 billion litres of petrol have been saved. In the first quarter of 2013, European sales have increased 82% year-on-year, accounting for 21% of Toyota’s sales total. Customers in the UK and Europe who choose hybrid enjoy lower cost of ownership and attractive tax benefits. However, the Toyota Prius is still probably the best known eco car and it remains ahead of its game – Toyota set out to create a car for the 21st century which is exactly what they have done. There’s no doubt that the Toyota Prius is a good car with a strong fan base but it will become even more attractive as a motoring proposition if potential buyers looked into its leasing costs to see how much more they could save by driving one. This entry was posted in Car Leasing, Car Updates & Releases, Cars, Eco Car, Low Emissions Cars, News and Views and tagged 21st century, caption, car, eco car, Europe, hybrid vehicles, lease the Toyota Prius, lexus, lexus hybrid, Lexus IS, Lexus IS 300h, Lexus LS 600h, prius+, speed, toyota, toyota hybrid, Toyota Prius, UK, Yaris Hybrid by Steve Lumley. Bookmark the permalink.